Samui is not a surfing destination. If anything, Phuket is by far better place to find surf in Thailand. Majority of swells on Koh Samui come from the winds in the bay of Thailand. There are occasional ground swells from Philippines, that may last over a week or longer. Wind swells last a few days and are followed by rainy weather. 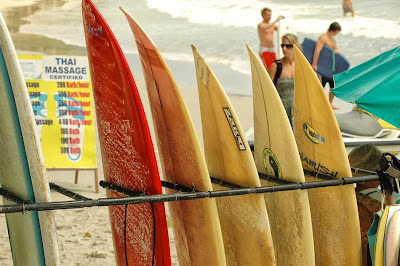 The main surfing area on Koh Samui is Chaweng beach. From about central part of Caweng beach where the reef ends, one can find waves during the surf season. 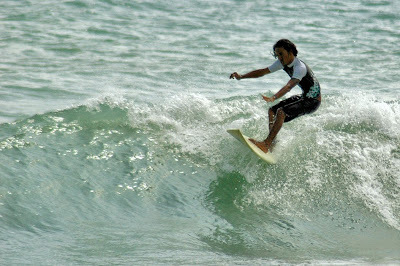 Surf season on Koh Samui starts from the end of October and continues through April. Every year is different, and some are better than other. The entire Chaweng beach is divided into two beaches - main one Chaweng and smaller beach Chaweng Noi. The divide is a rocky point right where First Bungalow resort is located. Waves break on both beaches but the best ones are throughout main Chaweng beach from Al's resort to the First Bungalow resort. The peak of the surf season is from January till the end of March. Wave size depends on the swell of course, but the average Samui wave is 2-4' on the face. On better days waves size goes up to 4-6'. There are however days when the surf is high and mighty. Waves can reach up to 9' and conditions get more hazardous. Usually the second or the third day of a big swell is more organized and the wave shape becomes nicer. Beach breaks have shorter rides 25-50m, but waves at the point last longer and can be up to 100 meters. Wind swells are more tricky than ground swells and surfers need to read waves well to score a nice ride. There are quite a few Thai surfers and expats from all over the world who get out to the lineup. It's friendly in the water and everyone is just happy that the swell arrived. Along the beach there are surf board rentals (or boogy-boards). Boards for rent a mainly ESP brand which is an epoxy made generic surfboard from "fish" to long board style. 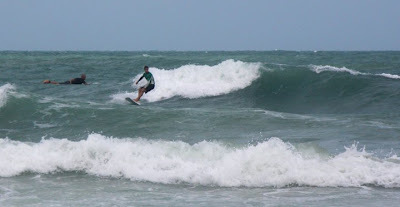 Short boards are more rare and less suitable for Samui surfing. Of course if the rider is good, any board can work, but for an average surfer "fish" or fun board is a comfortable choice. Board rent is about 300bht an hour, but if you take board for the entire day, hourly rate drops. Water hazards: ther are no sharks near Koh Samui and the only real danger when being in the water, comes from jet-skis. There are all kinds of people who go for a jet-ski ride and some are just extremely bad. It's a good practice to watch around and let them know that you are in the water. There are pieces of wood and big logs in the water during big storms. They float free and can be on the way. Also fisherman's lines and buoys may be in the water in some parts of the beach. Of course, since Chaweng beach is a very touristy place, people in the water present biggest hazard of them all. Surf on Samui is nice. It's not the biggest and a bit slow and tricky, but the water temperature is about 28-30C and there are not many people out most of the time.